Expanding upon his role as the “musician’s musician” in Jewish music, Gershon Veroba bridges the divide between Jewish and secular music. No two albums have ever been alike. 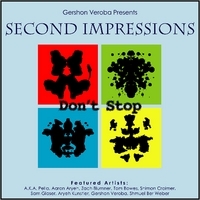 Gershon Veroba has decided once again to give the people what they wanted in a product only he could deliver. In 2003, he produced the unique Impressions CD, which changed the way the people enjoyed re-written pop songs. "I decided to take it seriously," he said, "and put some genuine meaning and entertainment for Jewish people in the real world , while using better quality, familiar songs, recreated as close as possible to their original excitement." "There are many who resent or fear secular music, while so many others hate today's repetitive and predictable Jewish music. People still look for new music, but their choices have narrowed down. Many feel secular music represents giving up, listening to songs that have little or nothing to say to us as Jews." Gershon has carefully chosen songs that adapt well to their revised lyric. "The new words offer a unique message in a familiar setting. People tell me, 'this was always one of my favorite songs, but now you've added something fresh to it while it still feels the same." He also added that the old songs get a new life. "I'm always hearing about kids and adults who never heard the original, but love the revised version. Some even hear the original and think it was a copy of mine!" To keep the original "feel," authenticity is very important and Veroba's standard is very high. "It has to sound similar to or better than the original, otherwise, the message is not taken seriously. Even the funny songs need to be done this way, or else doesn't have the same impact, like a good joke told badly." One way he keeps it fresh is by inviting guest vocalists to broaden the styles covered on the album. Gershon brought old and new friends together to bring out unique quality of each song. Guest artists include debut newcomer, Beri Weber and high school stars Aaron Aryeh & Zach Blumner, starring alongside Gershon & his famous friends.